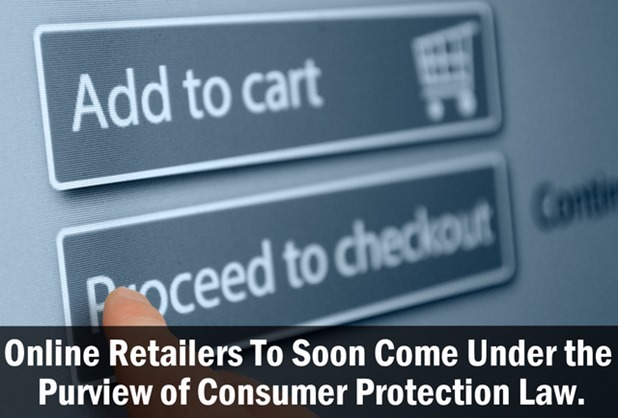 Online Retailers Will Now Come Under Purview Of Consumer Protection Law. Online retailers in India are thrilled with the unprecedented boom in the e-commerce sector in India. The Indians are buying online never before and the trend seems to be catching on. The online retail market in India which has been valued at around $3.5 billion (Rs 21,000 crore) is expected to witness over 7-fold growth by 2019. Now, while that may mean a huge business opportunity for online selling portals, it also gives rise to the need to keep consumer interests in mind. Especially after several online retailers have been accused of unfair practices and duping the consumers. In early 2013, we had written about a Flipkart buyer who was delivered two stones instead of an iPod costing Rs 20,000. After that, there was a furore when a Snapdeal buyer was sent two coconuts instead of the Slazenger shoes he had ordered for himself. The most recent incident involving Laxminarayan Krishnamurthy from Mumbai took an altogether different turn when he posted pictures of the Vim bar he had received instead of the Samsung Galaxy phone he had ordered over Snapdeal on Facebook. HUL, which manufactures the popular dishwashing soap wowed him and won over millions of hearts by actually sending him a Galaxy phone! While these incidents we are talking about got viral over networking sites and got talked about, a large number of frauds and malpractices by e-retailers go unnoticed because the consumers choose to lament over their loss and curse their fate rather than taking the legal recourse. Besides these much talked about incidents, there are hundreds of complaints about getting faulty or substandard products from disgruntled consumers almost everyday. Telemarketing companies have also been accused of such frauds many a times. Keeping that in mind, the consumer affairs department has moved a Cabinet proposal to bring online retailers under the purview of Consumer Protection Law. The proposal comes on the heels of Union Food Minister, Ram Vilas Paswan’s recent statement about the need to inform online buyers in India about their rights and the need to take action against such companies if they indulge in fraudulent practices. While this move from the Consumer Affairs Department is being appreciated, there is much that has been left out of its purview. While we have reasons to believe that this differentiation is being done to separate the actual sellers of goods and/or services from those acting as mere marketing entities, it is being seen as a big loophole at present. The proposal also makes it mandatory for sellers to provide transaction records like cash memos or bills along with their products, because no action can be initiated by the buyers against fraud perpetrators without any such record. A Consumer Protection Authority might act as a watchdog for marketing of products that are “unsafe and hazardous”. Online retailers and telemarketers have been allowed to get away with irregularities and fraudulent practices for a long time because of the absence of any regulatory body to look into such matters. While we hope that this proposal helps to bring online buying and selling in the country more user friendly so that the customers can be assured of good and prompt delivery of goods or services ordered over the plethora of sites that keep popping up every day, much would depend upon the customers themselves. As long as they don’t bring incidents involving frauds, misrepresentation, spurious and substandard products to light, the regulatory bodies will be able to do little to help them. GOSF 2014 Promises Unprecedented Deals, Discounts & Buzz!